This creamy simple egg salad makes a tasty sandwich or is the perfect addition to a plate of baby spinach! It’s true that as we age we can develop little quirks. I’m not sure this counts as a quirk, or if I’d consider it really resourceful, but I have a confession. When I go to Panera, I always choose the baguette side even though I never actually eat the baguette side with my meal. I mean, it’s a lot of food, particularly if you’ve ordered a sandwich, to then also add a hunky piece of baguette on top. So … I bring the crusty piece of bread home. Ideally I have the paper bag left to store it, but I’ve gone so far as to wrap it in napkins and stow the bread in my purse till I get home. See what I mean about age quirks? I remember my great-grandmother bringing leftover biscuits home from restaurants, wrapped in neat little bundles and hidden in her purse. Or, at least that’s what I tell myself. Once home, the baguette gets repurposed for things like garlic bread with pasta, toasted and buttered with fried eggs, or with sandwiches! 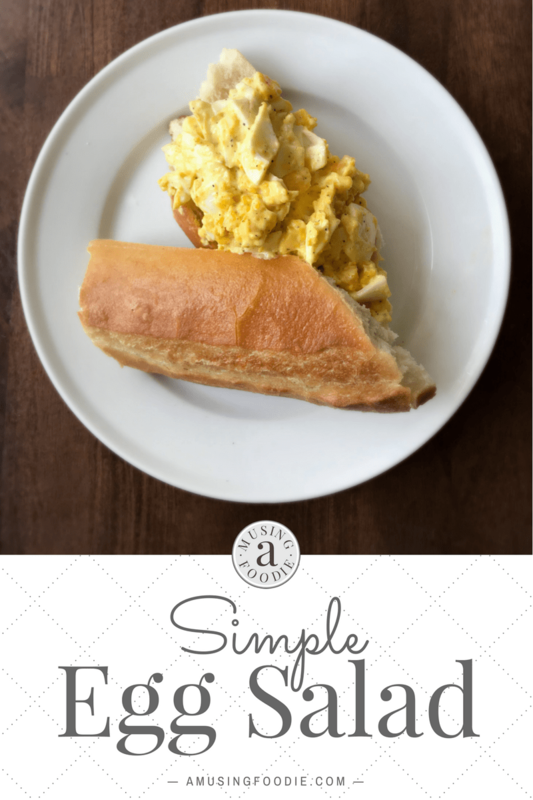 One of my favorites is this simple egg salad. You can whip it up in less than thirty minutes (even if you have to hard boil eggs—I don’t usually have them already hard-boiled) and it’s creamy, a little bit salty, and just perfect on that leftover crusty baguette from Panera. Mix all the ingredients together. Chill for 15 minutes. Serve on crusty bread.